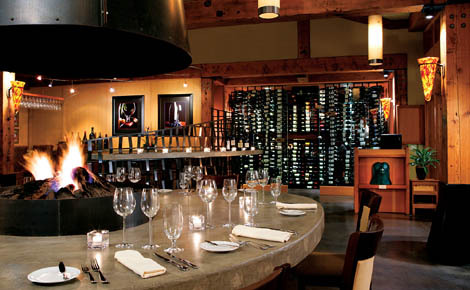 which serves a single-seating nine course dinner featuring seasonal food of the Pacific Northwest with six paired wines, or it’s next door neighbor, the award-winning Barking Frog? At the end we decided to select the Barking Frog, mainly because we had heard that the dinner at The Herbfarm could take hours to complete- which normally would not detour me one iota, however, after a full day of wine tasting I thought it might prove to be a challenge best left for another time. After entering the Barking Frog, the only thing I didn’t care for was the name…I still don’t think of frogs as barking…however I ADORED my whole evening. (That afternoon I had some misgivings when I found out that since it was Father’s Day, Chef Bobby Moore had taken the evening off. One of the reasons I chose the Barking Frog was because just weeks before Chef Moore had received rave reviews when he was invited to cook at NYC’s James Beard House.) No worries though, the food, ambiance and service could not have been better, and I haven’t stopped barking…I mean raving, about my dinner all week. Grand Marnier Prawns– delicately flash-fried. The Grand Marnier sauce provided just a kiss of sweetness. Smoked Muscovy Duck Salad– pretty presentation. The ginger vinaigrette cut the richness of the duck and I loved the wonton crunchies. Buttermilk Fried Quail– This one didn’t quite measure up to the description. Loved the quail, but thought the black pepper waffle laden with maple syrup, was too heavy for a starter and would work much better as a brunch item. We had two seafood entrees, both were equally succulent… the Alaskan Halibut served with a pea and grilled prawn ravioli, morels and a lovely carrot gastrique, and the Black and Blue Wall-Eyed Tuna, napped in a light green tea sauce, resting on a bed of cellophane noodles with spicy sambal green beans. For dessert we shared a luscious warm Rhubarb Butter Tart, sided with a refreshing scoop of acacia honey sorbet, and a touch of lavender. Barking Frog is definitely worth the drive from Seattle, (although I was very happy we were spending the night just steps away on the compound.) Actually, it’s almost worth the drive from San Francisco!! !